Wilde is talking about sales. Where there are no sales, there is no money. If you are in business for yourself, it won’t matter how good you are if you don’t have any customers. Getting and retaining customers must be high on your list of daily activities. Otherwise, you aren’t going to be in business for long. In my seminar business, if I don’t “send out ships” to get people to attend the workshops, there won’t be anyone in them, and I won’t make any money. End of business. But since this was the most “confrontational” aspect of my work, I found I’d do just about anything else during the day. That’s what paperwork is for—it’s an excuse not to market your business. I’d reach the end of the day and feel like I’d worked hard, but stayed unconscious as to how many sales calls I’d made. Then one day, I was complaining to a friend about working too hard and not making enough money. He asked how many sales calls I made each day. I looked at him blankly. “I don’t know, exactly,” I said. He only had to raise his eyebrows and I got the picture. 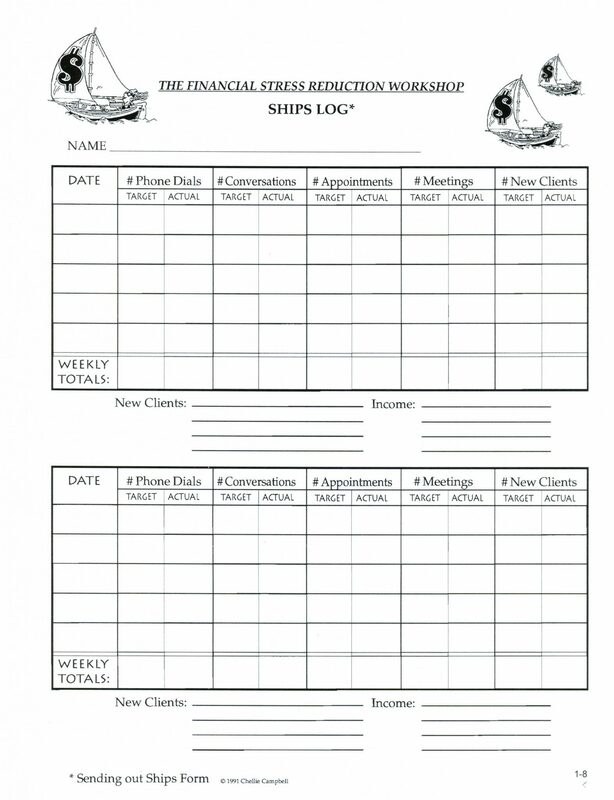 This is the Ships Log I use. At the beginning of the day I’m going to make calls, I write down how many times I intend to dial the phone, how many conversations I expect to have (instead of leaving messages), how many appointments to meet or talk with someone I will set, how many networking meetings or appointments I have today, and then how many clients I expect to get in the “Target” section of the form. As I make calls throughout the day, I make hatch marks in the “Actual” column. If you keep track faithfully, you will know exactly how many phone calls it takes to get a client. Then you multiply your actions to achieve the results you want!